As the Olympic sailing teams prepare to hit the water in the 2012 Olympic Games, Great Britain’s Ben Ainslie is focused on making history. If he’s able to win a fourth straight gold medal in Olympic sailing and his fifth straight medal overall, he will likely become the most accomplished sailor in Olympic Games history. Before he can accomplish that feat, Ainslie will have to get past the US’ Zach Railey in the men’s Finn. Railey surprised much of the world at the Beijing Olympics when he earned a silver medal in the men’s Finn, finishing just behind Ainslie. 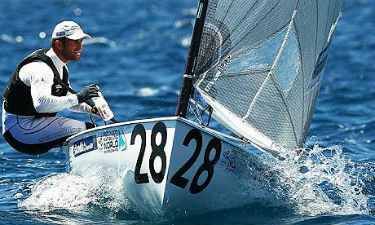 Now, Railey is after the top spot and you can watch him and Ainslie compete live online for free when 2012 Olympic Sailing begins. Also competing for the US Olympic Sailing Team in the women’s Laser Radial is Zach’s sister, Paige Railey, who is making her first Olympic appearance. One athlete you’ll want to be sure to watch when the Olympic sailing events stream live online for free, is US Olympic Sailor Anna Tunnicliffe, who won the gold at the first ever Laser Radial event in the Beijing Olympics, becoming the first US woman to win Olympic sailing gold in 20 years. This time, Tunnicliffe enters the Olympics as part of a three-person team, competing in the women’s Elliot 6m match racing event alongside teammates Debbie Capozzi and Molly Vandemoer. Be sure to watch Olympic sailing live online for free so you can see if Tunnicliffe and her No. 1-ranked match racing crew can take home the gold. Italian windsurfing sensation Alessandra Sensini is another big name to watch when the Olympic sailing events stream live online for free, as she is competing in her sixth Olympic Games. She will be looking to add another gold medal to her resume in windsurfing’s final year as an Olympic sailing event. Over the years Sensini has collected one gold medal to go along with two bronze and two silvers. There are 10 sailing events at the 2012 Olympic Games in London, which will take place from July 29- August 11. The men and women both compete in the Laser Radial (one person dingy), 470 (two-person dingy) and the RS:X (windsurfing). However, only the men compete in the Star event (keelboat) and the 49er (two-person dingy high performance), while only the women compete in the Elliot 6m (match racing), an event that was just added to the Olympic sailing schedule in 2012. As soon as Olympic sailing begins on July 29 at 7am ET, you can start watching all of the Olympic sailing events live online for free. All you have to do is visit FreeCast’s Live Streaming Coverage Guide and you can watch Olympic sailing and your other favorite Olympic sports live online, absolutely free. If you are without a television or a computer, you can always watch Olympic sailing live online for free with your mobile device. Men’s 470 Medal Race Preview – Thursday, August 9: Some podium favorites in the Men’s 470 sailing event are Great Britain’s Luke Patience/ Stuart Bithell, Argentina’s Lucas Calabrese/ Juan de la Fuente and Australia’s Malcolm Page/ Mathew Belcher. Page won the gold in the Men’s 470 Race at the Beijing Games with then-teammate Nathan Wilmot and he comes in to the final as part of the gold medal favorite duo once again. The 470 Medal Race will begin at 8am ET. Men’s Preview: In men’s sailing, Great Britain’s Ben Ainslie is the man to watch considering he has won a gold medal in three consecutive Olympic Games coming into London. Zach Railey of the US will provide Ainslie with some stiff competition in the men’s Finn after taking home the silver in Beijing. Great Britain’s team is the overall favorite in men’s sailing, though Australia has also put together a very good team for that could challenge the Brits for the podium. In the Star class, keep an eye out for Brazil’s No. 1-ranked pair of Robert Scheidt and Bruno Prada.